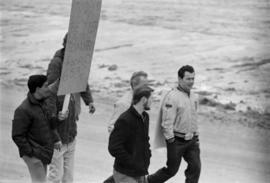 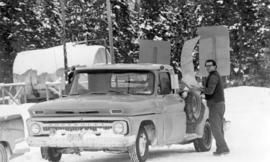 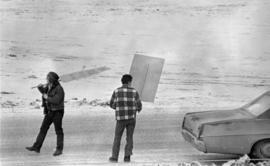 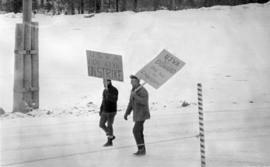 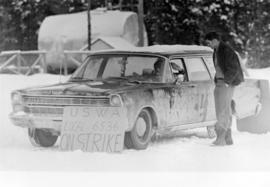 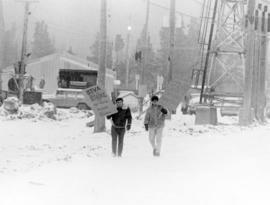 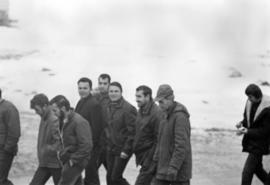 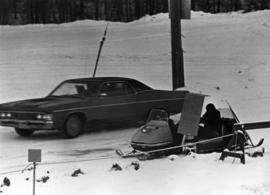 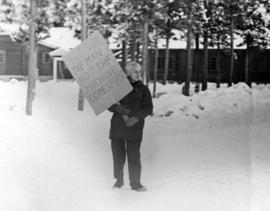 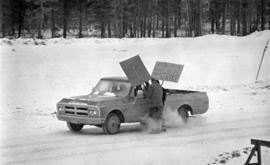 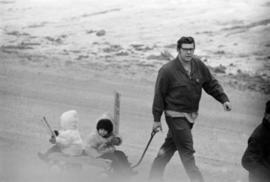 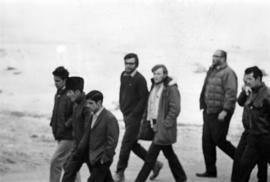 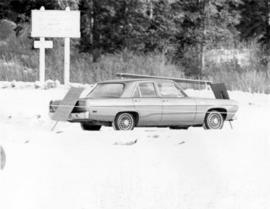 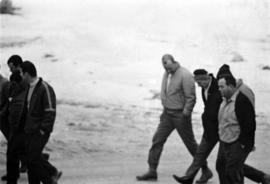 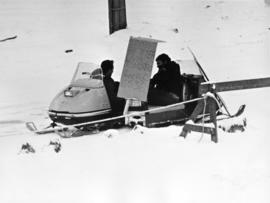 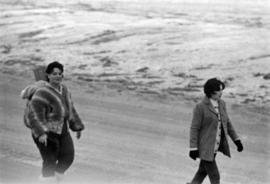 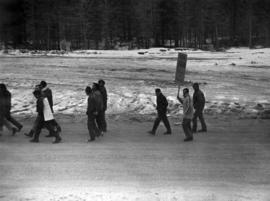 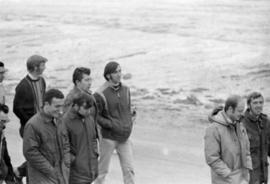 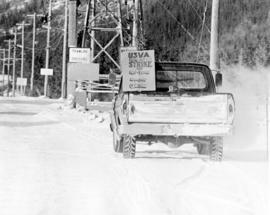 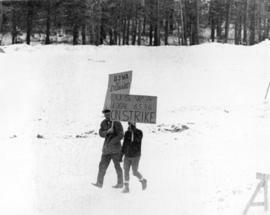 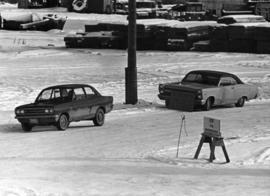 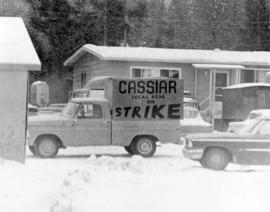 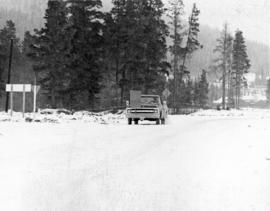 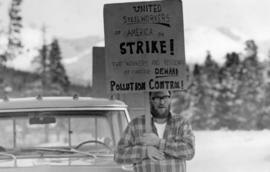 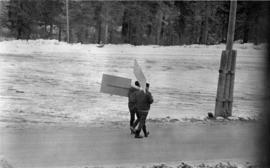 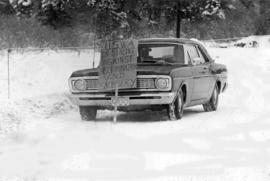 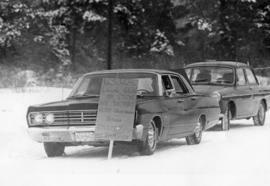 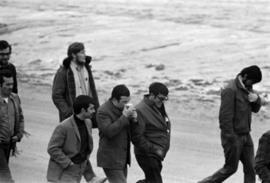 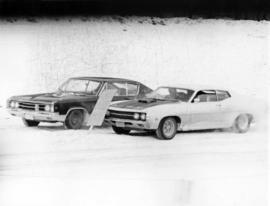 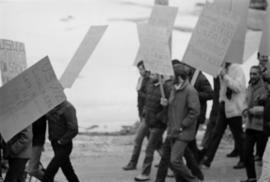 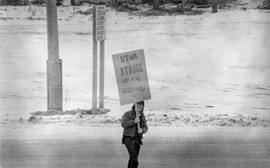 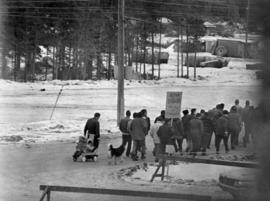 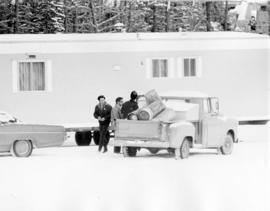 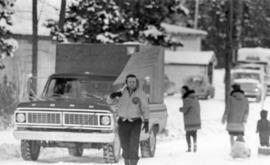 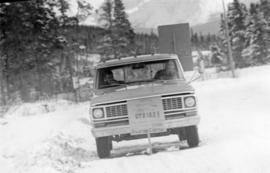 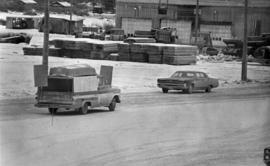 File contains photographs depicting individuals at Cassiar on strike in the winter time, marching down roads, holding picket signs, carrying small children who hold signs, and driving cars covered with strike slogans. 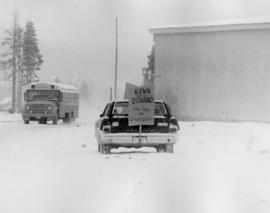 Many of the signs read "U.S.W.A. 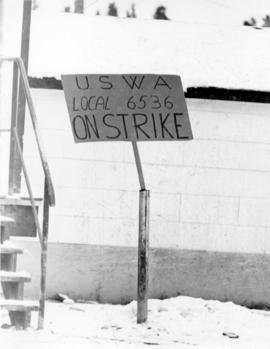 LOCAL 6536" (United Steel Workers of America). 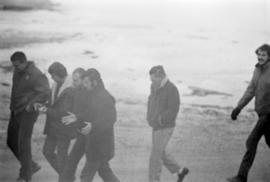 Two photographs depict a man with a video recorder. 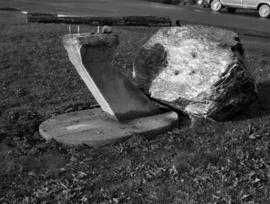 Some photos feature plant buildings, two were taken at night. 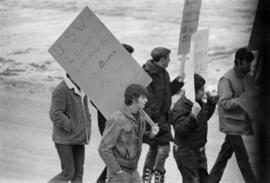 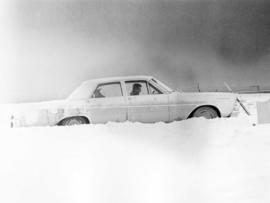 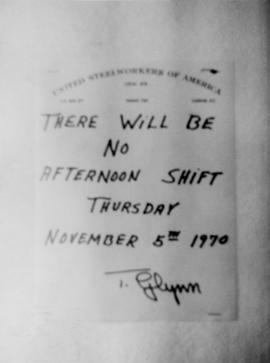 One photograph depicts a note that reads: "THERE WILL BE NO AFTERNOON SHIFT THURSDAY NOVEMBER 5th 1970." 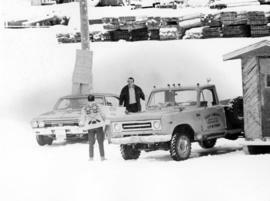 Many photos depict areas in the mine showing snow impacts, fissures in the mountain, asbestos evidence and other environmental activity. 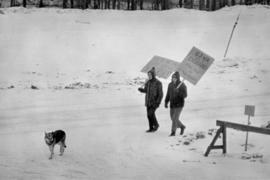 The picket signs contain protests regarding contracts, safety, environment, and ethics. 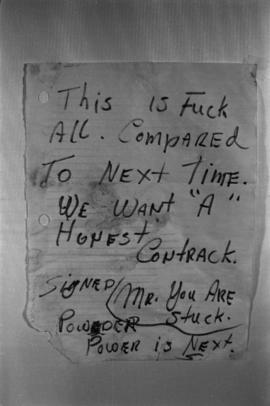 Handwritten annotation on original envelope containing photographs: "Pictures 1970 Strike." 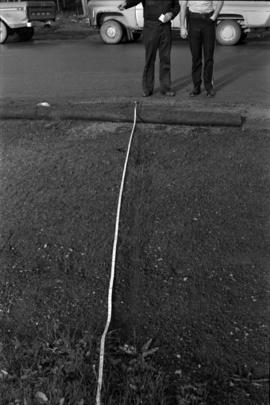 Integrated into file are fourteen photos from file marked "Mr. B. Pewsey" that depict an area where a large rock fell, measuring tape, and protest sign. 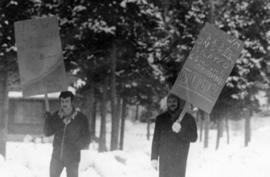 Items have been rehoused and arranged according to numerical annotations on recto. 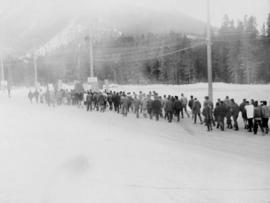 Original accession no. 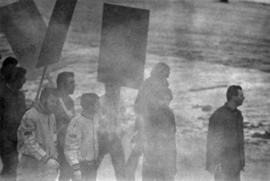 : 2000.1.0685.028 [these photographs came from box 685].